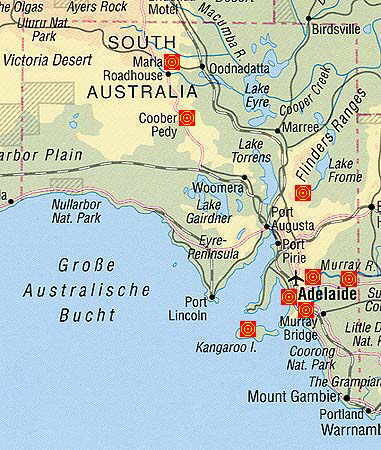 In South Australia there live almost 1.5 million inhabitants on 984.277 square kilometers (1998). South Australia is the driest state with the highest share of semi-desert. In addition it is the most urbanised part of Australia having one million people living in the Capital Adelaide. Being not far from Adelaide Barossa Valley is a world wide well known wine growing area. The third biggest island called Kangaroo Island is a daytrip from the Capital. On the way into the outback and the opal city Coober Pedy there is a turnoff from Stuart Highway to the beautiful bushwalking area of the Flinders Ranges.